REAL FUNCTION. Mixer with Rotating Whip. Toaster with Timer and Pop-up Toast. Fillable Blender with Rotating Function. Kids Can Do Same Things Like in Real Cooking! PREMIUM QUALITY. Made with Durable Thick ABS Plastic. Bright Color. None Toxic. BPA Free. Toys Certified Conform to US Toy Safety Standards ASTM F963. ENDLESS FUN. This Comprehensive Pretend Play Kitchen Appliance Play Food Toy Set Provides Hours of Entertainment to Children Who Love to Imitate Adults Cooking. The Pretend Play Progress Trains Kids Eye-Hand Coornidation and Creative Imaginations. Mixer and Blender Need 2XAA batteries for Each. Batteries not Included. REAL FUNCTION. Mixer with Rotating Whip. Toaster with Timer and Pop-up Toast. Fillable Blender with Rotating Function. Kids Can Do Same Thing Like in Real Cooking! Mixer and Blender Need 2XAA batteries for Each. Batteries not Included. ENDLESS FUN. 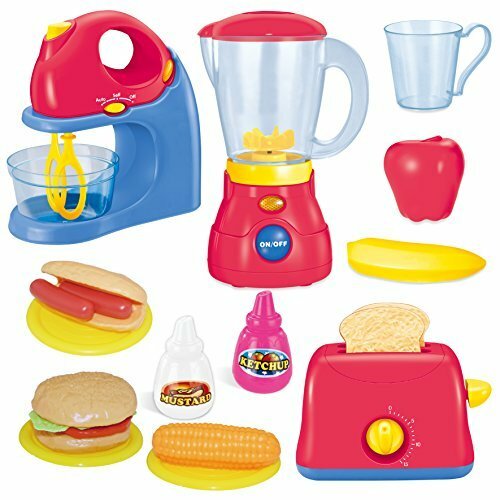 This Comprehensive Role Play Pretend Play Kitchen Appliance Play Food Toy Set Provides Hours of Entertainment to Children Who Love to Imitate Adults Cooking. The Pretend Play Progress Trains Kids Eye-Hand Coornidation and Creative Imaginations.